Ben H Winters has made a habit of writing what might be called crime fiction/dystopian mash-ups. His trilogy The Last Policeman was set on an Earth that was about to be decimated by a giant asteroid, and his last book, Underground Airlines, was set in an alternate present-day America in which slavery was never abolished. 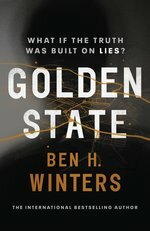 So it is no surprise, perhaps, that his latest book, Golden State, is also a heady mix of dystopian ideas and noir crime fiction. … the captures are on: captures on every corner, captures in every doorway, forging history, putting us on the Record. Reality in progress. The ambulance crew is trailed by its own Record team: more capture operators, more microphone bearers, more archivists. Everybody keeps everything. You know it; I know it. Archiving is a bulwark. … [T]his solemn responsibility borne by all good and golden citizens: taking the time every evening before it gets to be midnight or before you go to sleep, whichever comes first, to curate the day that has passed. To compile all interaction stamps, all recorded observations, all receipts and paperwork from the day that was, gather it all up into a Mylar bag, seal it and mark it and file it among all the other days of your life. Everything is on the Record … the goal is simply the maintenance of reality as it occurs, so that all can live together within the same sheltering truth, safe within the strong high walls of the Objectively So. … We are the ones with the power, and the license to truck with lies – we can sense them, we can handle them, and we are empowered to emit them ourselves. To construct different versions of the truth so each can be tested, so all might fall away until only the real one remains. Laz has a classic noir detective backstory. A hero brother who brought him into the force and died bravely, to whom he always feels he is being compared. His wife has left him and his enemies are keen to remind him that not only was this his fault, but that he was never good enough for her anyway. And he is saddled with a bright-eyed young rookie who challenges his weary attitude with gung-ho enthusiasm. Laz is thrown into what can only be described as a classic noir detective situation: a seemingly simple open-and-shut case of a roofer falling off a roof in an apparent industrial accident that slowly spirals out into a conspiracy. Suspects die mysteriously, records that are supposed to be sacrosanct disappear, and it seems that there may not be any such thing as ‘Objectively So’. And now here I am, with rain dampening my beard, inside one of those moments when one’s inmost truth sits in uneasy disagreement with the acknowledged truth of the world. There are distinct echoes of some of the classics of political dystopian fiction in Golden State. If anything, the surveillance state is taken a step further than 1984, with citizens willingly surveilling themselves. There are also echoes of Fahrenheit 451 in this world where fiction does not exist and the word ‘novel’ means a story in which everything is true (the most famous being Past is Prologue – “the long and beautiful history of the first days and years of the Golden State, of our seven heroic founders and the obstacles they overcame and the gifts they left in passing”). You go back far enough in history, ancient history, and you find a time when people were never taught to grow out of it, when every adult lied all the time, when people lied for no reason or for the most selfish possible reasons, for political effect or personal gain. They lied and they didn’t just lie; they built around themselves whole carapaces of lies. Imagine if everyone did it. Imagine if each person was allowed the luxury of claiming their own truth, building a reality of their own in which they can live. Imagine the danger that would pose, how quickly lies would metastasize, and the extraordinary threat that would pose to the world. For two-thirds of the book, the investigation and the way it illuminates Winters’ thought-experiment society works. But just as the action heats up, it starts to feel as if Winters is not sure where to go with the idea and the wheels fall off. The analogy is stretched as far as it can go and is unable to snap back into any kind of satisfying resolution. But despite an unsatisfying ending, Winters’ dystopia is a fascinating conception, and of the many, many literary dystopias out there at the moment, it is one worth dipping into. This review first appeared in Newtown Review of Books.